The Fedora App provides a central location for Fedora users and contributors to stay updated on The Fedora Project. 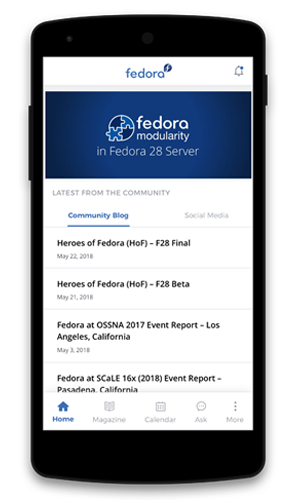 News updates, social posts, Ask Fedora, as well as articles from Fedora Magazine are all held under this app. This is the source for the Fedora App. Be taken directly to Fedora Magazine official site. Search, vote, and answer questions. View events for Fedora from all different SIGs including QA, budget, classroom, etc. Add event to device calendar directly from app. View the date, time, and description of the event. Download the installer for Node.js 6 or greater. Note: Python 3 is not supported. See the requirements here. Note: You may need to add “sudo” in front of any global commands to install the utilities. See npm documentation for more details. Configure your JAVA_HOME and ANDROID_HOME to point to Java and Android SDK installation directories respectively. Clone this repository: git clone https://pagure.io/Fedora-app.git. Run npm install from the project root. Copy src/app/config.env.ts.example to src/app/config.dev.ts and src/app/config.prod.ts. Replace the example API keys inside them with real API keys. Run ionic serve in a terminal from the project root. Open http://localhost:8100 to preview your app. Ommitting the --prod will generate a debug build which is useful for Android/iOS remote debugging. Ionic DevApp is a free app that makes it easy to run your Ionic apps directly on an iOS or Android device. This avoids the cumbersome Native SDK installations. Install Ionic DevApp on your phone. Connect your phone and computer to the same network. Run ionic serve -c from the project root. Open Ionic DevApp and lanuch Fedora app from the list of available apps. npm test runs all unit tests defined in the app. Start the ionic dev server with npm run ionic:serve -b. Wait for the dev server to start.